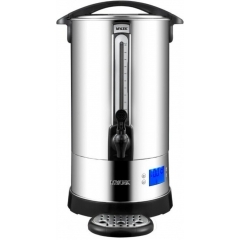 If you need a catering urn to provide your workplace with a constant supply of boiling water, it’s essential for you to look at MYLEK’s range of catering urns. Featuring the UK’s first digital catering urn – the MYLEK Xpresso – our range of tea urns gives you the performance you should expect for your business. Catering urns can be used in any business to increase efficiency as you can make hot drinks for your staff and customers all day long without wasting time and energy on constantly re-boiling a kettle. A catering urn should be considered essential for kitchens, catering businesses (especially catering vans), offices, community groups, and anywhere you need to serve large numbers of people with hot drinks all day long. At MYLEK, we understand the importance of safety when it comes to catering urns, so every tea urn in our range is designed right here in the UK and tested to meet the highest safety standards. No matter what your budget or requirements, you should never feel the need to compromise on safety, so you can browse our range of catering urns on this page with complete peace of mind.